Several weeks ago, I was trolling around YouTube looking for inspirational/motivational videos to watch, and I ran across an 18 minute video of author Elizabeth Gilbert at the TED Conference from a couple of years ago. 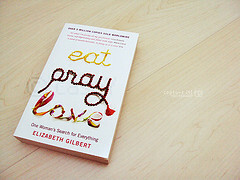 If you're not familiar with who Elizabeth Gilbert is, she is a best-selling author who recently reached rock-star status through her book Eat, Pray, Love . I must preface the remainder of this post by saying in no way am I endorsing the speeches, writings, philosophy, or religion of Ms. Gilbert. She grew up as a child with a Protestant background, but currently practices Hindu-type meditation. Through her Eat, Pray, Love book, she claims that her journey was a quest to discover or to know God, but I would argue her journey is not that of a follower of Jesus Christ (I don't think she would argue this statement, either). A religious debate is not the point of this post. OK, so with that disclaimer out of the way, let me go back to Ms. Gilbert's TED Conference talk. In her speech, she discussed the philosophical make-up of modern day creative people. She explained how for the last 500 years since the Age of Renaissance Humanism, creative people have taken on the sole responsibility for their creative work. If their work was brilliant, then they were brilliant. If their work bombed, then they were thought of as failures and losers. This current creative mindset has created a culture of manic-depressive type personalities in which authors, musicians, and artists have hit the bottle or worse yet, taken their own lives due to the roller coaster journey of success and failure of their life's work. Elizabeth Gilbert then reached back into ancient history and analyzed how our current creative mindset was not that of ancient artists. The ancients recognized that works of genius were more "acts of the gods" or divine inspiration rather than man inspired. If an artist's work was a success, then it was a result of divine, spiritual intervention. If the artist's work was a complete miserable failure, then hey, it wasn't entirely their fault. Ms. Gilbert argues that the ancients had a healthier mindset for the creative, artistic personality. In her own journey in writing Eat, Pray, Love , she mentioned that there were a few occasions where she struggled in writing her book. Through her writing, there were a few instances where she wanted to give up on the whole project because in her mind it was turning out to be the worst book ever. But, every morning she continued to show up to write. She claims that she started taking on the mindset of the ancients where she would "pray" to her muse that she was doing her part by showing up each day and doing her part in the writing process. Her muse needed to show up and do his or her part in the writing of the book - the divine, genius, inspiration part of the process. Let me restate that in no way am I endorsing the religious-philosophical views of Elizabeth Gilbert, but I believe even Christians can learn life lessons from non-believers. After watching this video, what I gleaned from her message is that I can maintain a similar philosophy, but instead of praying to some mystical muse, I can pray to God the Father through the Son, that the Holy Spirit would bless my walk with the Lord, as well as His will and work for my life. At five o'clock in the morning, when I'm sitting in my home office reading and meditating on His Word, I can pray for His Word to penetrate my heart and use me in a more effective way in what He has called me to do in my life's mission. But I need to show up wherever I need to be at that time and do my part. As a parent to two young daughters, I need to show up and be engaged as a father. I need to love them, instruct them, and yes, sometimes I need to discipline them. I need to follow through on my part, but then pray that God through the power of the Holy Spirit would do only what He can do. As a leader in my church, I need to be engaged in leading those that God has called me to lead. I need to show up and do my part and, at the same time, ask the Lord to show up and do the ministry work that only He can do. As I write blog entries, I can pray that the Holy Spirit would give me creativity and insight in my writing. I need to do the hard part of setting aside the time, energy, and commitment to write, but then I need to allow the Holy Spirit to do His part in blessing that work. What's your mission here on earth? What has God called you to uniquely do that only you can accomplish for His Kingdom purposes? Be sure to show up faithfully and consistently for your part of God's work for your life, but also be sure to pray that the Holy Spirit's power would be infused in that work to accomplish what He desires. What are you "Doing" in your life? | Do something!